Over the summer, I was verdy fond of all things yellow. The tray in the photo below? I couldn't be without it after seeing it in Maison Du Monde in Spain. I wore yellow like I was walking around trying to get people to call me Big Bird, but that yellow shade in Fuschia's Paradise Palette? That shook me to my core because I am a bridie of a certain age! But sure listen, the rest of the shades in the palette called to me and I listened. I listened and I filmed a video showing it in action that you can see over on my Instagram. The packaging is lightweight, colourful and has a slim mirror. Grand job. The swatches below show the shades in action and while I haven't used the white one yet, it would be a good one for setting a concealer when cutting the crease, if you were so inclined. I don't know the last time I used a white shadow, but this has inspired me to give it a go. The yellow swatches really well on my arm, but I was playing with it, patting it onto the lid and it didn't have the same colour payoff. But in saying that, it works beautifully when blended out in the crease. The rest of the shades are just fab. The warm brown, third from the left applies better than it swatched and is easily buildable. The orange and red are perfection and are the stars of the show. The plum shade, second from the right, applied well onto my lid, but did require building up for the look I wanted. Two layers did the job and it blended easily into the crease too. I tried using the brown on the right in a different look and it was a bit patchy on me and didn't blend out as easily as the other shades, but it made a lovely powder liner on the top lashes. I think this is one of my favourite looks ever in life! 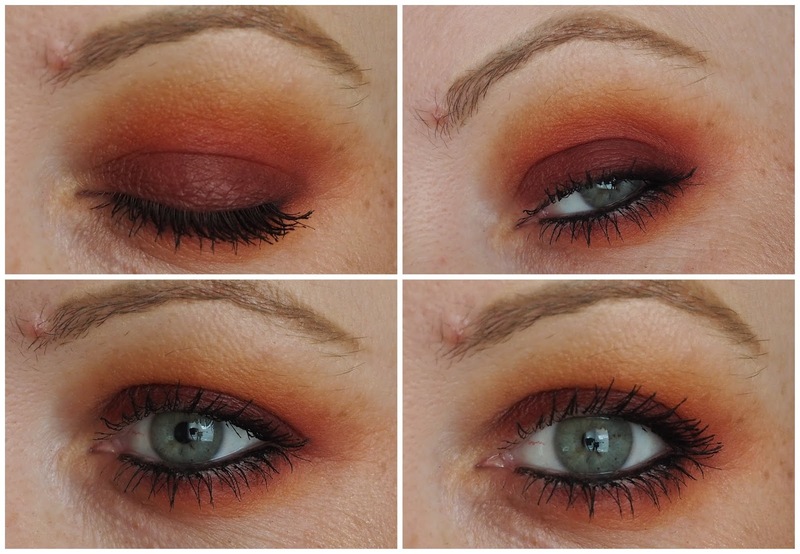 I used the medium soft brown, the orange, red and plum and ended up with a bit of a sunset happening on the eyes! You can see that the blend is seamless and while the shadows looked a bit scary going on, they were so blendable and were a doddle to apply. I wanted to amp it up a bit so applied black liner to the waterline to tie it all together, giving me a whopper autumnal look! Make sure to watch my video on Instagram showing this palette in action! You can pick up the palette here! Will you be trying it out?